Gingivitis, a mild form of gum inflammation, can cause red, irritated gums. It’s often uncomfortable, annoying, and painful. The earlier you’re able to catch signs of gingivitis, the more likely it can be reversed. Gingivitis is a condition where your gums get sore, red and inflamed. If you let gingivitis become more serious, it can become a chronic gum disease, called periodontitis, which can result in tooth loss. Gingivitis is your body's natural response to harmful bacteria that sticks to your teeth. This sticky film, called plaque, releases acids that attack your teeth’s enamel and causes decay. When you forget to brush, floss, and rinse out your mouth, plaque builds up and keeps working at your teeth’s enamel. After about three days, if plaque is still hanging on, it becomes tartar along the gum line. Tartar makes it difficult for you to clean your teeth and gums completely. Tartar buildup leads to gum irritation and inflammation, causing gingivitis. What Are Symptoms of Gingivitis? Gingivitis is reversible. First, remember the early signs of gingivitis listed above, so you can stop it from progressing before it affects the bone around your teeth. Good oral hygiene habits are very important in reversing gingivitis and to stop it from coming back. Brush your teeth twice a day with a soft bristle toothbrush and floss at least once daily. Just these two simple routines help keep bacterial plaque off teeth and away from the gums. Replace your toothbrush when it’s worn or old. Frayed bristles don't clean as effectively, especially around the gum line where bacteria will build up. Dry mouth gives bacteria a better environment in which to grow because saliva aids in washing away bacteria from both your teeth and gums. Keep your mouth moist by drinking lots of water. Lozenges and gum (with no sugar) help stimulate saliva, especially if you have dry mouth. What Are Some Things You Can Do to Prevent Gingivitis from Occurring? See your dentist every six months for cleanings. Dental cleanings remove tartar and plaque buildup from your teeth and gum line. Avoid sugary and starchy foods. Mouth bacteria feeds on starches and sugars from food, increasing the acid release that attacks your teeth’s enamel. Junk food and candy contain high amounts of starch and sugar, so avoid them to have healthier teeth and gums. Substitute water for sugary drinks. Eat high fiber foods such as fruits, vegetables, beans, whole grains, nuts, and seeds as a healthy way to get your carbohydrates. Quit smoking. Smokers are more susceptible to gum infections. Smoking also makes it harder for gums to heal. Be vigilant with your brushing, flossing, and rinsing every day. 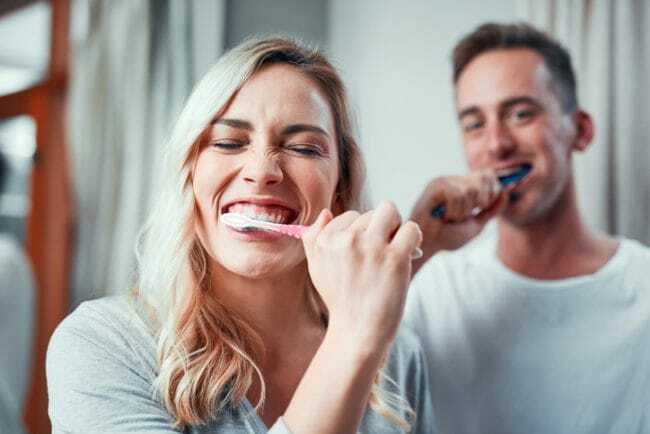 Good oral hygiene, combined with a healthy diet and regular dental cleanings, can go a long way in reversing or preventing gingivitis and preserving your beautiful smile. Dental365 is open seven days a week, with extended business hours on weekdays, for your convenience. Walk-ins are welcome. We also offer affordable care and financing options. Contact us today at 844.365.DENTAL or request an appointment by filling out this form to learn more about what our periodontists can do to improve the health of your smile.